Ascending Butterfly: One Meaning Couture Signature Butterfly Pendant Review and Giveaway! One Meaning Couture Signature Butterfly Pendant Review and Giveaway! This giveaway is now CLOSED. Thanks so much to our wonderful sponsor One Meaning Couture, We look forward to working with you again! The winner has been notified and upon confirmation his/her follower name will be posted both here and on our homepage. Remember: There are still some great giveaways active on the upper right hand side of the page! I think it's safe to say that we all know by now I am very much butterfly obsessed. I love them for many reasons. They represent change and growth. They also represent loved ones who have departed. And for me a specific color butterfly sighting has always foretold a major change or a stroke of good luck (sometimes BOTH). I've begun to amass quite a collection of butterfly pendants and a favorite has emerged from what is a very varied, unique and impressive collection! And that's no easy feat! I have a way of knowing when a new piece of jewelry is 'mine', I can't stop rubbing it! Even if it has no specific gemstone, I find that I can't stop rubbing or pressing it between my fingers! I have found my latest 'touchstone' pendant, it's One Meaning Couture's Signature Butterfly Pendant! Unique meaning behind the Signature Butterfly Pendant: It is made inscribed with the numbers 813, which stands for 8 letters, 3 words, 1 meaning..."I love you" - the numbers were formed into a butterfly so that love can take flight. On the wings of love! It will remind you love is eternal and you can carry it with you always. This beautiful pendant is made by a talented artisan on the West Coast just for One Meaning Couture. It is truly a unique and beautiful necklace that will garner compliments every time you wear it. The dimensions are 1.50” wide by 1.25” high, cast in highly polished 950 Sterling Silver. Comes on a 30” sterling silver curb chain. And what truly sets One Meaning Couture apart from the rest, is that they donate 8.13% of all sales to a different charitable organization each month! It really is couture with a conscience! Isn't that awesome? How many times do you get to actually make a difference by shopping? I also wanted to point out that One Meaning Couture also accepts recommendations for which charity to feature! You can send One Meaning Couture the name of the charity you’d like to see featured by sending an email to Barbara@OneMeaningCouture.com. WIN IT! - Ascending Butterfly and our friends at One Meaning Couture want to help you carry love with you everywhere you go this year! One incredibly lucky 'Ascending Butterfly' follower will have the chance to win One Meaning Couture Signature Butterfly Pendant of their own! Can't wait to see if you won? You can get your own Signature Butterfly Pendant (or any other design that tickles your fancy) with a special coupon code! Because One Meaning Couture uses Paypal, which does not support coupons, please put in "Ascending Butterfly" in the notes of your order at check out and you will be refunded a 10% discount via rebate. This would make an amazing Valentine's Day gift for your special someone, your BFF, your mom, your sister, your niece, your daughter, (or your favorite butterfly loving blogger!) With a super discount AND a charitable donation on top of it all, now folks THIS is truly POWER shopping! How to Win: (1) You must be a follower of Ascending Butterfly to be eligible for this and all giveaways. Indicate in your entry that you follow (if your 'comment name/user id' differ from your profile id, please let me know what name you follow under) and (2) Visit One Meaning Couture and pick another piece you like and post the direct link to your selection here (3) You must also leave your email address somewhere in your comment. (You can format it this way for security, example: ascendingbutterfly AT mail host DOT com). Please follow the easy 1, 2, 3 steps to winning! This giveaway is open to USA residents who are 18 years of age or older. Ƹ̵̡Ӝ̵̨̄Ʒ - NEW METHOD OF EXTRA CREDIT: Enter One Meaning's Valentines Day Poetry Contest! Send your entry to Mia@OneMeaningCouture.com by midnight on February 14, 2010. To get your extra credit on Ascending Butterfly you must CC us in your entry tiglesias625 (AT) gmail (DOT) com (this is formatted for security purposes please fix before you submit your actual poem. Remember to comment here that you have submitted a poem, in addition to your CC to us on the email. Poem MUST be cut and pasted into an email - NO ATTACHMENTS please. There is no limit to length of poem, but keep in mind that if your poem is long, only a portion will fit on the jewelry being given in first prize. This is NOT a paid endorsement/insertion. All opinions are expressly my own! 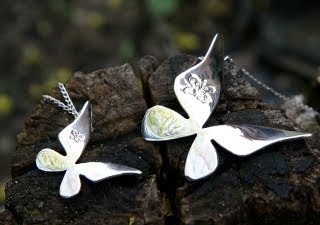 One Meaning Couture provided a Signature Butterfly Pendant for Review and will be providing a pendant for the Giveaway. I follow One Meaning Couture on twitter as nina0205. I'm a follower. I like the Starry Starry Night bracelet in chocolate. This is the link for the piece I would like. It is the butterfly effect necklace. "Small changes lead to big things". Following Ascending Butterfly with Google Friend Connect (Bacallsmom). I love their Signature Flower Power Necklace. I follow One Meaning Couture on twitter. I subscribe. I like the Language of Love necklace. I follow OMC on Twitter. I like the butterfly effect necklace. I love love love unique pieces, which is why the Gold-Devons feather bracelet: http://www.onemeaningcouture.com/gold-devons_feather.html is my favorite piece. I follow @OneMeaning on Twitter @couponlover16. I am a Facebook fan of Ascending Butterfly (Laura Hulke Wales). I am a FB fan of One Meaning (Laura Hulke Wales). I joined your Ning group (Laura Wales). I love the silver Love Floats necklace. I follow One Meaning Couture on twitter (jenbutterfly). FB fan of Ascending Butterfly. I follow One Meaning - Couture with a Conscience on Facebook. I follow Ascending Butterfly on facebook (jennifer garrido). I follow Ascending Butterfly on Networked Blogs (jennifer garrido). I joined your Ning group (jennifer garrido). I faved you on technorati. (jenbutterfly). I'm a follower. I love the Dragonfly Unisex Bracelet.